At the annual shareholders meeting in March, Disney CEO Bob Iger revealed artist renderings for the three newest Disney Cruise Line vessels that are expected to set sail in 2021, 2022, and 2023. While those dates seem far away, the preparation to have them constructed has already begun. According to The Disney Cruise Line Blog, Meyer Werft, the shipbuilder, disclosed the three ships’ new hull numbers, along with some ship specifications in a press document. The new hull numbers are as follows, ship #5 (which will set sail in 2021) has the hull number s.705, ship #6 (which will set sail in 2022) has the hull number s.718, and ship #7 (which will set sail in 2023) has the hull number s.706. Unfortunately, the ship names are still listed as, “To be announced” on the press documents. 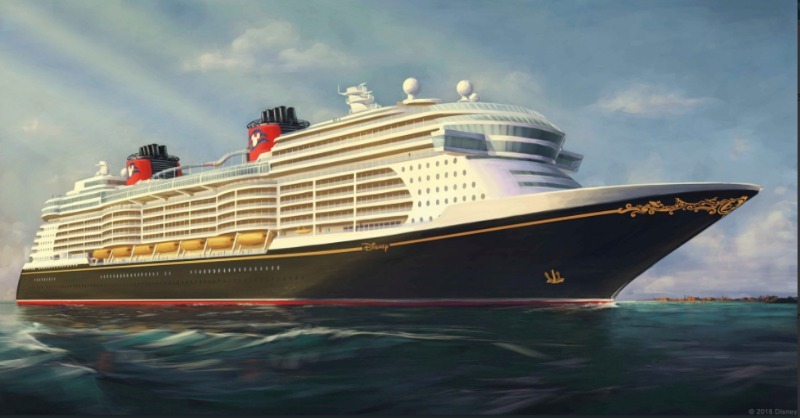 The press documents also show that the ships will be 4 meters (about 13 feet) longer than the Disney Dream and Disney Fantasy, but have the same passenger payload of 4,000 guests. It was previously revealed that each ship will weigh approximately 135,000 gross tons, and are expected to hold about 1,250 guest staterooms.